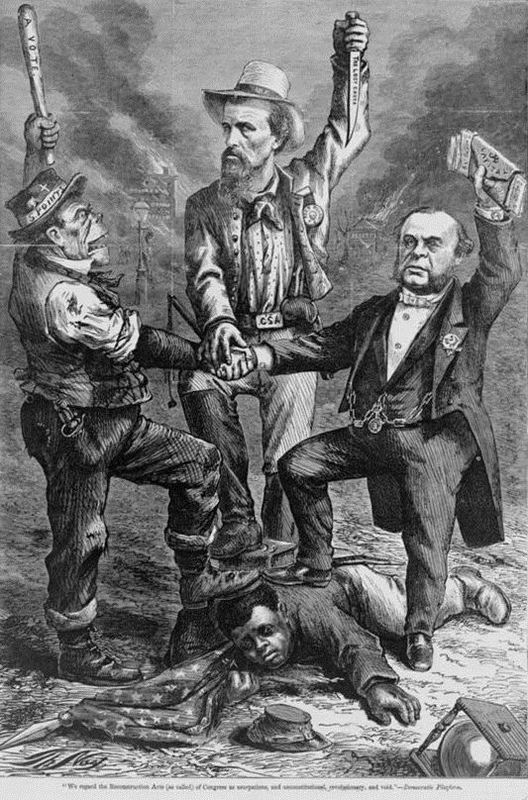 "This is a white man's government," Democratic platform regarding the Reconstruction Acts, 1868, print by Thomas Nast, Harper's Weekly, courtesy of Library of Congress Prints and Photographs Division. Unit Five: Conservatives Respond to Emancipation outlines the various ways conservative white southerners struggled to accept defeat cooperate with federal authorities after the Civil War. The Unit Five educational documents listed on the left feature excerpts of various primary source documents and first hand accounts that provide in depth insights into their strategies for resisting the end of the Confederacy and African American slavery.